Fort Henry Rendezvous starts Wednesday of the first full week in June. 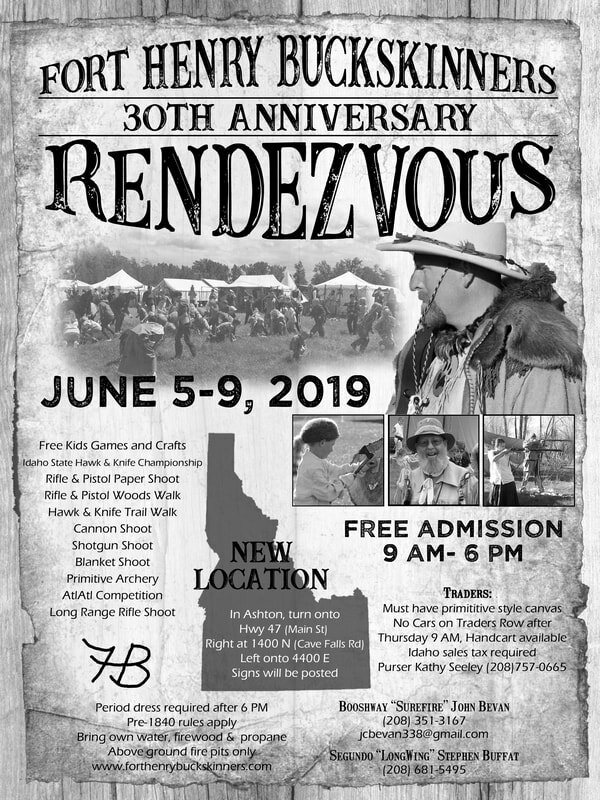 This event is in a great new location, not far from Ashton, Idaho, and is open/free to the public. Both primitive canvas camping and modern RV space are available. Competition events include black powder paper shoot and woods walk, traditional archery, tomahawk and knife throwing course, primitive fishing, dutch oven cook-off and more. Kids games, crafts and candy cannon happen consistently through the day. Guests are welcome from 9:00- 6:00 Thursday through Saturday, then in the evening primitive dress is required. A lot of effort goes in to making sure our Rendezvous will be a unique and memorable activity for families. This is an experience you can't have any other place!